Synopsis: Hydrophilic polyurethanes have the unique property of being able to absorb or otherwise manage moisture-and this makes them valuable in medical and a number of other important commercial applications. This new book provides a concise, unified presentation of hydrophilic polyurethanes technology and applications. All important topics from chemistry, analysis, processing and quality systems to product development and applications are covered clearly and systematically. The text is well illustrated by more than 45 flowcharts and diagrams and supplemented by more than 20 data tables. 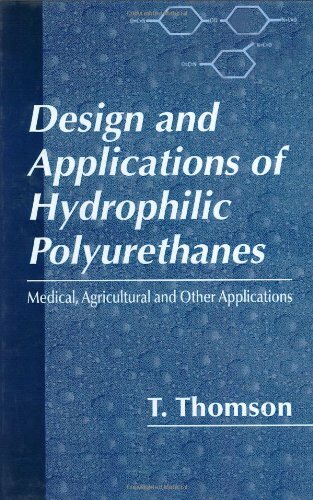 A special feature of this new book is its inclusion of case studies of recent development of commercially valuable products using hydrophilic polyurethanes. These case studies illustrate how these unique materials can be tailored to specific application needs. The information in this new book will be useful to all those involved in the research, development and applications of polymers, biomaterials, and other materials whose utility requires the special properties of hydrophilic polyurethanes. To receive your copy promptly, please order now. Information on ordering - by mail, fax, telephone or the publisher's secure website - follows the complete table of contents on the reverse. Tim Thomson is the director of Main Street Technologies, an independent research organization specializing in the development of advanced medical materials and devices. Previously he was technical manager of the Hypol Group, W. R. Grace & Co. He is recognized as an authority on hydrophilic polyurethanes and their use in medical device and other applications. He has an M.S. in Physical Chemistry from Michigan Technological University and has been awarded six patents in synthetic chemistry and process control.